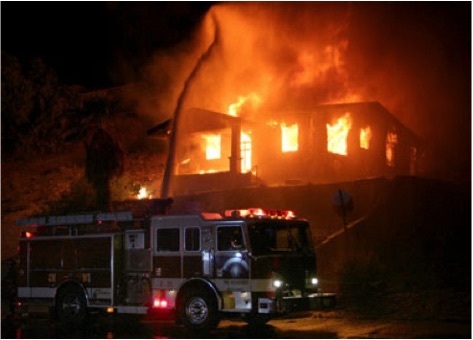 These statistics are excerpted from the Residential Fire Loss Estimates released by the U.S. Consumer Product Safety Commission. 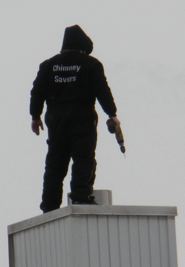 The National Fire Protection Agency says chimneys must be inspected and / or swept yearly. 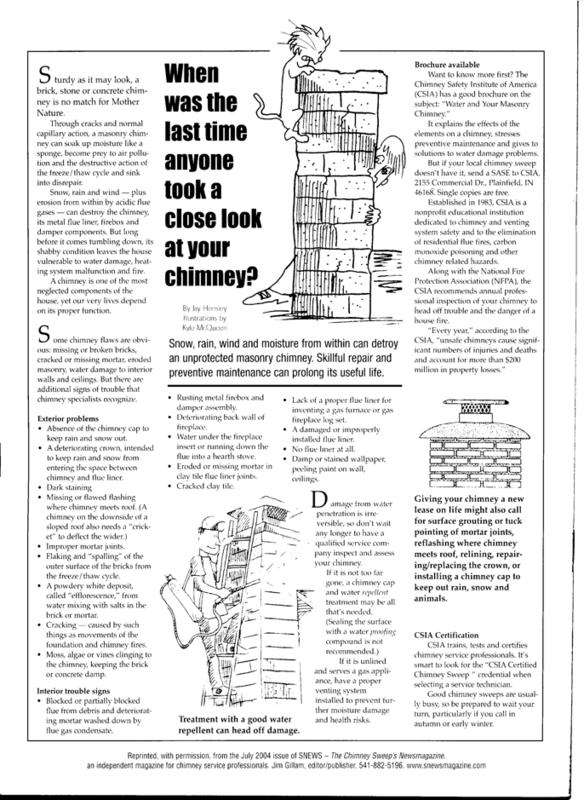 Your chimney for that system should be inspected and / or cleaned every year. Oil furnaces that ran for awhile in a bad state of repair should be swept immediately. Wood stove and fireplace chimneys may need to be swept after every cord of wood burned. Has yours been swept this year? Storks nesting in chimneys were once believed to bring good luck, according to European folklore. But, in fact, nests in chimneys - or blockages of any kind - are nothing short of bad news. They can cause smoking problems, chimney fires and carbon monoxide poisoning. Many American homeowners think their chimneys only need to be cleaned and inspected if they burn wood in their fireplaces or wood stoves. But almost all heating appliances, whether they burn gas, oil, wood or coal, rely on a chimney to safely carry out the toxic gases produced by the heating system. So they all need a yearly service call from a chimney professional. Oil fired heating systems: In addition to your yearly maintenance from your oil company your oil burning heating system’s chimney needs regular yearly inspections and / or sweepings by a chimney professional. 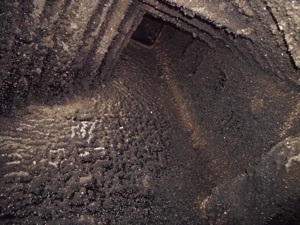 Chimney sweeping to remove soot build up is done every 3-5 years on average, never go more than 5 years between sweepings because when the oil soot builds up along the walls of the flue it effectively shrinks the flue size causing a decrease in draft which doesn’t allow heavy particles to be drawn up the flue. Then the heavy particles fall into the clean out and build up. Which will block the connector pipe to the chimney and cause a “blow back” of soot into the house. Blow backs are very common (we get over 50 calls a year from people this has happened to). Blow backs can cause a huge mess and usually require professional cleaning of everything in your home (walls, curtains, rugs, clothing, bedding and all surfaces). If the blow back happens at night when your sleeping, your family may awake covered in soot and will have breathed soot and sulfur dioxide in all night, when you wake up you will be blowing black, carcinogenic soot out of your nose. It’s a lot easier and better for your health to just sweep the chimney regularly. Gas fired heating systems: Even though gas is considered to be clean burning, gas heating system chimney’s need regular yearly inspections and / or sweepings by a chimney professional and should have chimney sweeping performed every 5-7 years on average to remove the acidic scaling that forms from the by-products of gas combustion and condensation, you really should not ever go more than 7 years between sweepings. 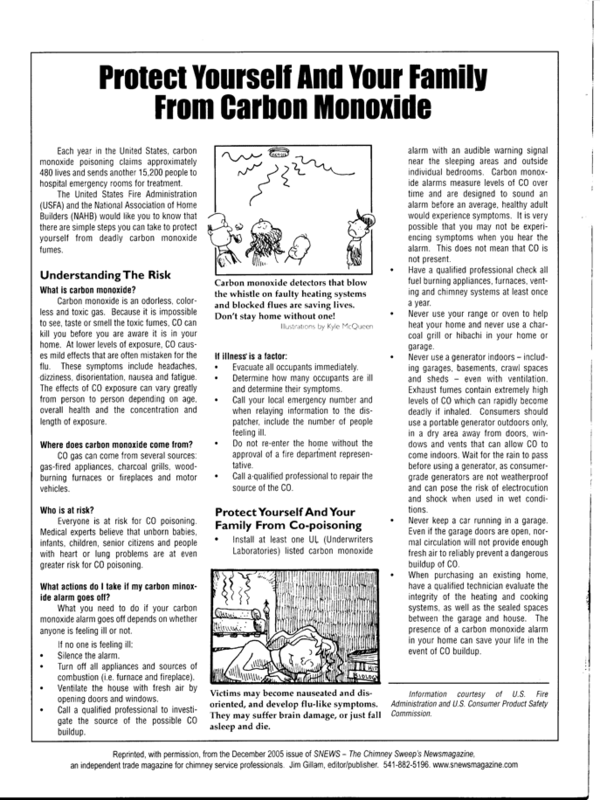 Carbon monoxide dangers are a serious issue if the chimney were ever to get blocked up (from things such as: animal nests, or liner collapse in worn out chimneys). Solid fuel burning (such as wood): Solid fuel fired chimneys must be swept yearly or possibly after every cord burned. The best time to sweep is late spring after all burning is done so the creosote doesn’t sit in the chimney all year (which can damage the flue lining). A dirty solid fuel chimney with only a quarter inch of soot contains the highly flammable tar like substance called creosote. A hot fire around 1000 degrees F. could easily cause stack temperatures in excess of 450 degrees F. (creosote’s low end temperature of ignition point) and ignite this substance into a roaring chimney fire. At the height of a chimney fire, the creosote can burn at temperatures exceeding 1800 degrees F. Flames and flying embers can easily land on the roof and ignite the wood framing of your home. The intense heat can cause the flue to crack or collapse possibly causing the interior walls of your house to burst into flames. 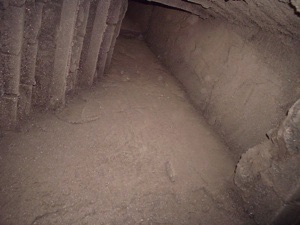 In un-lined flues thermal transfer can cause the wood framing of the house to ignite inside the walls. Creosote in chimneys comes in several stages. In its flakey, soot form, it is easily brushed away leaving safe and clean flue walls. When it appears as hard, brittle deposits, the chimney sweep's extra efforts in brushing will remove most of the build-up. But glazed variety is truly the most dangerous form, and the most difficult to remove from your home's wood burning system. And until recently, glazed creosote was almost impossible to completely remove in many instances. That's why today, Chimney Savers uses not only the traditional sweep tools but also the latest in powered rotary chimney sweeping equipment and high velocity industrial HEPA vacuums, most of our competition doesn't use this type of equipment. Glazed creosote in your chimney is recognizable by its dense, shiny tar-like appearance. This unpleasant substance is basically wood tar which has become baked onto the walls of the chimney or flue lining. Once it gets burning in your chimney, it is extremely difficult to extinguish. Unfortunately, there is no such thing as creosote-free wood burning. Creosote accumulation will occur no matter what kind of wood is burned and no matter what kind of wood burning system is used. What determines the type of creosote and its severity is how the fuel is burned. Solid fuel authorities agree that the amount of smoke, the temperature of the fire and the regulation of air (turbulence) are the major variables which determine the amount of build-up. A low burning fire, for example, will result in incomplete combustion, the number one cause of glazed creosote accumulation. 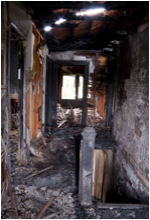 An improperly installed fireplace insert, one that allows the smoke to cool too quickly in the firebox, is another situation which causes severe glazing. 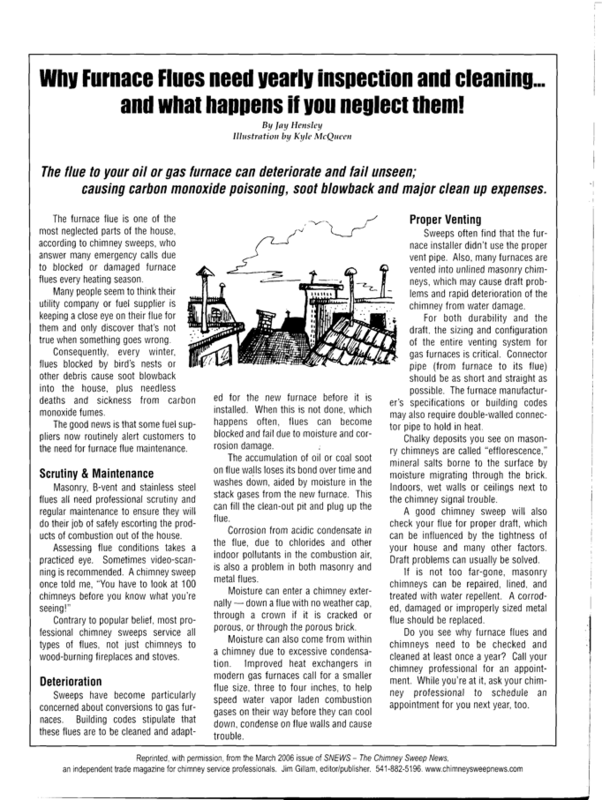 If your chimney sweep has already diagnosed glazed creosote as a problem in your chimney take his or her advice seriously. DO NOT continue to use your affected fireplace or wood stove. The simple fact is that a hot fire (or a rapid / hot burn of small floating particles such as burning paper, cardboard or trash) could easily ignite the glazed creosote and result in a dangerous chimney fire. A low burning fire under such hazardous conditions will only worsen the glazed creosote problem. Call us and we will solve this serious condition for you. Remember to have us sweep your wood burning appliance at least every year or sometimes after every cord of wood.